Aiming to strengthen the unique experience offered to executives through new programs, ISIS Asia-Pacific develops academic partnerships with local universities and institutes. 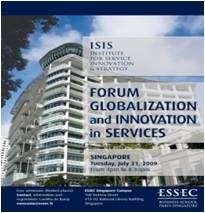 On December 3, 2012, ESSEC-ISIS signed a Memorandum of Understanding with the Singapore Management University in order to pool and promote their research efforts and Executive-oriented programs in shared fields of expertise such as services and innovation in a service-driven economy, both in France and in Singapore. Keynote speech of Prof. Hervé Mathe (Dean ESSEC Asia-Pacific) on "Economic Growth and Job Creation Driven by the Service Sector". September 19, 2013. Conference held at the Singapore International Chamber of Commerce (SICC), on the importance of services in the creation of value and the economic vitality of companies. ESSEC-ISIS co-organized the first Cross-Border Innovation & Entrepreneurship Symposium with the SMU, held in Singapore, on December 3-5, 2012.
at ESSEC's Singapore campus. July 21, 2009 with Nespresso, Club Med, Essilor and Tata Consulting Services.